One out of three people 65 and older fall each year. 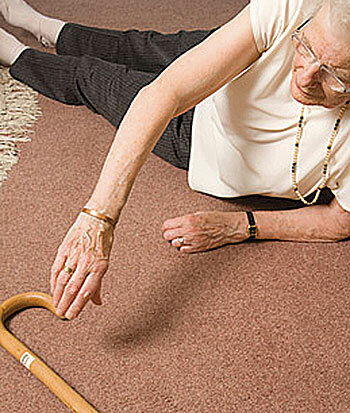 Falls are the leading cause of death due to injury for seniors. One bad fall can be the difference between a healthy, independent lifestyle and a lifestyle of complete dependence. I run a local home-care agency providing in-home care for seniors, so they can remain independent in their own homes for as long as possible. Unfortunately, I know all too well the impact one fall can have on a senior’s health and lifestyle. Not long ago, I visited an elderly man and his family in his home to discuss our services. This elderly man experienced a couple of recent falls. Nothing serious he assured me, but serious enough to recognize that it was time to seek the assistance of professional help and we scheduled to begin services with one of our care providers the following week. I received a call two days later from one of his children. The man fell. This time, it was bad; so bad that he ended up in Dominican Hospital in critical condition. The fall had completely devastated this man who just one week prior was in great physical and mental health. Overnight, he lost his ability to walk, to feed himself, even to use the restroom. One bad fall completely stripped him of his independence. He was bed-ridden and placed on Hospice Care. After a couple of weeks in the hospital, he was allowed to go home with the assistance of our in-home aides and a Hospice Nurse. Within a week of returning home, the man passed away. This story is not uncommon. That one fall was the catalyst for this man’s sudden and drastic decline in health and unexpected death. What can we do to prevent our elderly loved ones from falling so they can remain safe and independent for as long as possible? First, address the issue directly with your family member or loved one. Don’t be surprised if they are not entirely forthcoming about their fall history. Discuss the possible consequences of a fall. In many cases, the results are a complete loss of being able to care for him or herself. Second, identify areas of risk in the individual’s living environment and make adaptations to promote safety while minimizing fall hazards. Install equipment like grab bars in the bathroom. Determine if there is a need for a shower bench in the shower. Replace any existing rugs with non-slip rugs or remove them altogether. There are many situations to consider and many resources available to determine what can be done in the home to reduce the risk of falling. Start by making an appointment with your loved one’s primary-care physician to assess their condition and possibly refer an occupational therapist to visit the home and assist in making decisions to make the home a safer place to live. Alternatively, you can also call Safe at Home Senior Care for a complimentary in-home assessment. Finally, don’t be afraid to ask for help. Talk to family members, friends, members of your church and other important individuals in your life that can check-in to make sure he or she is safe. If you live in the Aptos La Selva Fire District call for 685-6690 or email mikec@aptosfire.com to sign up for a free “No More Falls” home assessment.